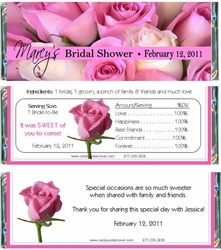 Our lovely pink roses Bridal Shower chocolate wrappers are simply "Lovely". One of our favorite candy bar wrappers complete with name, and date of Shower. Perfect for the occasion, this candy wrapper has it all! Perfect for Bridal Showers, Weddings and more. Chocolate is the SWEETEST favor and is sure to be a hit at your party!